A salad, is a salad, is a salad, right? Well, at some point in my life this may have been true, but today it is unequivocally wrong. When I was growing up, salad was made from pale iceberg lettuce, cucumbers and tomatoes, dressed with Thousand Island dressing. Do you remember those salads? I do, all too well! Today however, when I thumb through cookbooks or open food magazines, I feel a bit like Alice who fell through the looking glass! Salads are vivid and bursting with the flavour of exotic fruits, grains and vegetables. And the dressings! I could spend a lifetime sampling all of these scintillating dressings and never have to taste the same one twice! Today’s salad is one that I found in “Plenty More”, by Yotam Ottolenghi, and made recently for a group of friends. Everyone agreed that it was more than “blog-worthy”. The dressing is a miracle to behold! Red grapefruit juice, sugar and chiles are reduced and then seasoned with tart sumac, which pairs perfectly with the grapefruit, watercress and basil. I will be taking a big bowl of my salad over to Angie’s Fiesta Friday tomorrow. I think my buddies there will really enjoy this festival of flavours. If you haven’t joined us yet, I encourage you to do so at Angie’s blog – “The Novice Gardener”. While you are there, be sure to check out her wildly creative posts! Using a small, sharp knife, slice off the top and tail of 5 of the grapefruits. Cut down the sides of each grapefruit, following its natural line to remove the skin and white pith. Over a small bowl, cut between the membranes to remove the individual segments. Place in a colander to drain and gently squeeze any remaining juices into a small saucepan. Squeeze enough juice from the last grapefruit to bring the juice in the pan up to 1 ¼ cups. Add the sugar and chile and bring to a boil. Turn down the heat to medium and simmer until the sauce thickens and you have about 5 tablespoons left, about 30 minutes. Set aside to cool down, then whisk in the olive oil, lemon juice, sumac and ¼ teaspoon salt. To assemble the salad, put the grapefruit segments, onion, endive, watercress, and basil in a large bowl. Pour over ¾ of the dressing and toss gently. Add the remainder of the dressing if the salad seems dry. Serve immediately. All dressed up with a show-stopping dressing. How creative!…. 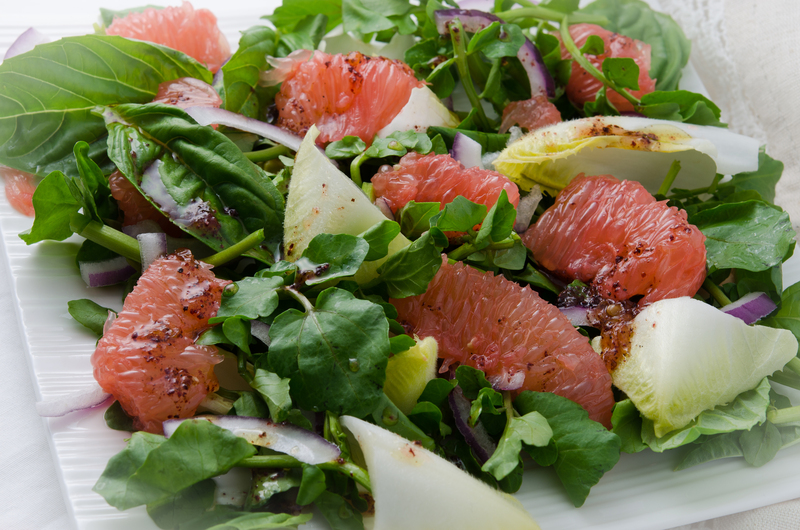 The pink grapefruit and sumac combination sounds so tefreshing…lovely salad! I have a bagof sumac I bought for Ottolenghi’s beet salad. He is a magician with his combinations and never ceases to open my mind to new discoveries. Always bang on too. Will try this for sure? I can always count on you to try something creative! Hugs! You are too sweet, Lori! Thanks! I am learning that often easy and delicious is the best beyond words! Thanks Kaila! You are so very lucky to have skipped those ice-berg salad days! Salad is my favourite part of the meal and it seems like there is a growing number of us who appreciate all of the wonderful variations of salad! I agree salads have come a long way. This looks delicious, I love Ottolenghi’s creations. Such fresh flavors- sumac seems to be good in most things too. Definitely one to try! Thanks for bringing to Fiesta Friday. I do love a good salad, and this one looks amazing!! What a refreshing salad! I’ve been wondering what else to do with the sumac we have, so this is perfect! This is a wonderful use for sumac! Hope you like it as much as I did! This is a beautiful salad! 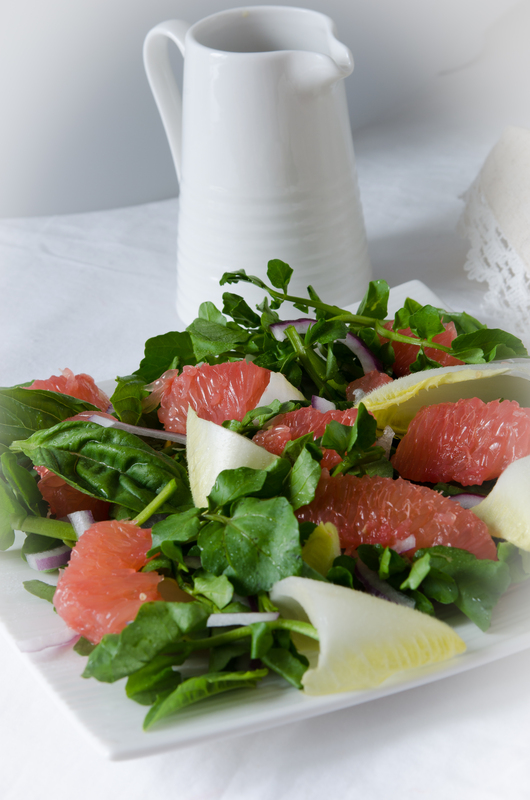 I love pink grapefruit, but never thought of adding it to a salad–love it! Thanks Nancy! I think you will really love grapefruit in your salads! I think we call the pink grapefruit Pomelo. Is this the big one? 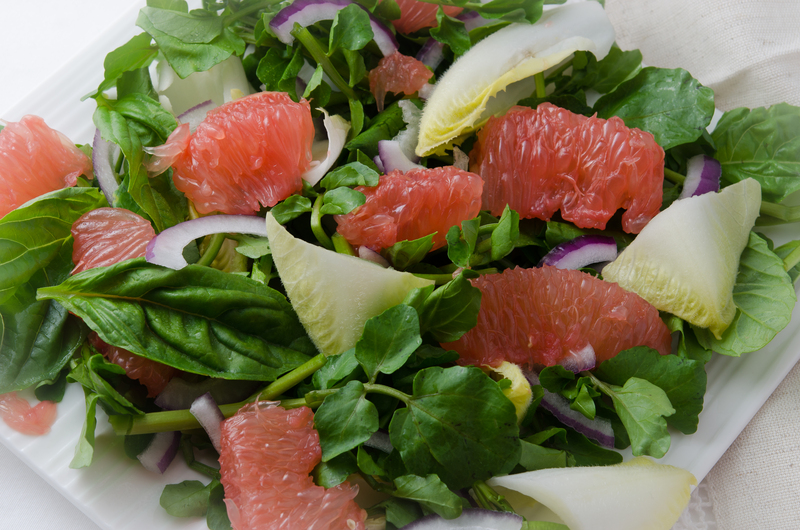 Beautiful salad, Julianna…the pink grapefruit lends a gorgeous hue! I have never tried sumac. I love to try new things, so I will need to try it! I love grapefruit in a salad. Beautiful photo! Who said that salad are boring??? Love yours! I would definitely eat this refreshing salad as often as I can. Just perfect for this season! I love it! What a lovely salad. I think sumac is so underused and this is a great combination. My favorite place for sumac is in the classic fattoush. I think your salad will be a new favorite. I remember those salads, too, Julianna! Haha! 😀 Your grapefruit salad looks scrumptious. Perfect for spring!